GROTON, Conn. — As it tries to get the most out of each of its $2.6 billion attack submarines, the U.S. Navy is finding a lot depends on the right paint job. A new painting process that helps keep marine life from fouling the hulls is among dozens of innovations aimed at reducing the maintenance needs for attack submarines, which are coming out of service faster than they can be replaced. "They're not very glamorous, but they're huge in terms of payback to the fleet," said Navy Capt. Mike Stevens, a manager for the Virginia-class submarine program at Naval Sea Systems Command. The changes were developed by private and government shipyards in response to a request from the Navy, which wants to squeeze more service life out of each vessel. In addition to the paint, updates include water-resistant grease for hatches, a special coating on the metal rods that extend the bow planes to minimize deposits, and redesigned water-lubricated bearings to improve support of the propeller shaft. The goal is for the submarines eventually to go eight years between lengthy and expensive major overhaul periods, up from six years currently. The submarine Virginia was commissioned in 2004, and 12 others in its class are already in service. The country is now building two a year to replace the aging Los Angeles-class attack subs. The nuclear-powered Virginia-class subs, which typically deploy for six months at a time, are capable of conducting surveillance in shallow waters and firing missiles among other missions and are expected to have service lives of about 33 years. While the submarine force says the demand on its 53 attack subs already exceeds their availability, the number in the fleet is projected to continue a post-Cold War decline and bottom out with 41 in 2029 before it begins rising again due to ramped-up construction, according to the Navy's shipbuilding plan. The design changes are intended to reduce costs and increase the number of combat deployments. "We want them to spend as much time at sea as possible," Stevens said. 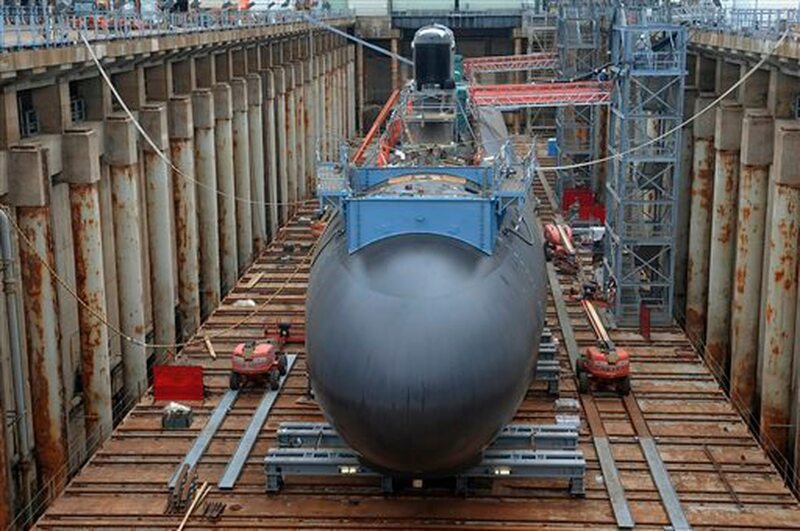 In Quonset Point, Rhode Island, where the submarines are painted, the Navy has invested in facilities to apply anti-fouling paint more rigorously during construction. During overhauls, the Navy also has adopted powder-coat, high-gloss paint applications that hold up better underwater and require less maintenance, Stevens said. At Electric Boat, the Groton-based submarine builder, workers tasked with finding ways to reduce maintenance needs came back with 800 ideas. Those were whittled down to 128 ideas that were recommended to the Navy, said Ken Blomstedt, the company's Virginia-class program manager. Nearly all of those changes have been incorporated into the design of submarines that are now in the beginning stages of construction, Blomstedt said. One challenge, he said, was ensuring that the submarine's sophisticated capabilities were not compromised. "That tenet of maintaining combat capability was first and foremost," he said.